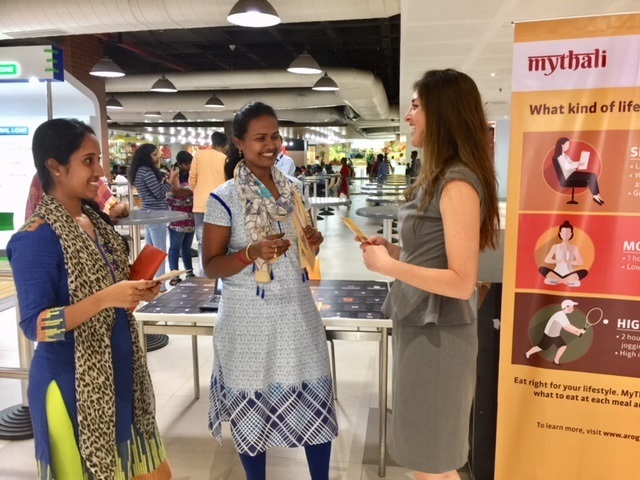 Earlier this year, Elena Orozco, an employee at global health service leader Cigna, was selected to serve as one of Cigna’s first Community Ambassador Fellows, traveling to India to help promote Arogya World’s healthy eating program, MyThali. Elena is now back from her time in India and has written a blog about her experience. My company, Cigna, has been a strong partner and sponsor for Arogya World since 2014. Our collaboration is rooted in a mission that is closely aligned—we work together to create a healthier, more secure world. 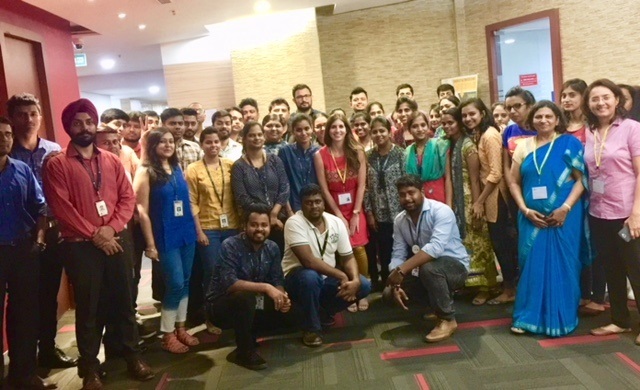 This year, I was selected to serve as a Community Ambassador Fellow for Cigna and I traveled to India to help promote Arogya World’s newest program, MyThali. After two and a half months in Bangalore, I’ve returned to California with newfound gratitude for bright sunshine, blue skies, tranquil commuting, and Trader Joe’s. India and the people I met during my fellowship will always hold a special place in my heart, though—especially my host family and Arogya World teammates. I never studied abroad in college and I’ve lived on my own for the past ten years, so heading into my fellowship I was mostly anxious about living in a stranger’s house. Now, those strangers are like family and I realize that truly immersing myself into their culture was one of the greatest gifts of my experience. I had the opportunity to see how the average household is managed with help from a cook, cleaning staff, a driver and the kids. My host family taught me about Hinduism, the history of the caste system, family life, Indian foods, arranged marriages and the significance placed on education and careers. They took me to explore temples, villages, parks, markets and historical sites. I tried to keep an open mind throughout. I believe that the more we see, the more we experience, the more we learn—the more we’ll be capable of accepting others, welcoming others, and understanding values, beliefs, and preferences beyond our own. Living in their reality prepared me to better understand the audience I was aiming to engage and the challenges they face when it comes to living and eating healthy. We decided “small wins” are what we should strive for. We changed our approach to engage people by asking them to think about just one, small change they could make to their daily eating habits that would help them align to MyThali. Many people pledged to eat more vegetables. Some said they would give up eating processed foods. Others promised to cut back on their overwhelming portions of carbohydrates. Even I acknowledged that there were areas where I could improve and I pledged to stop adding sugar to my coffee (three months down!). 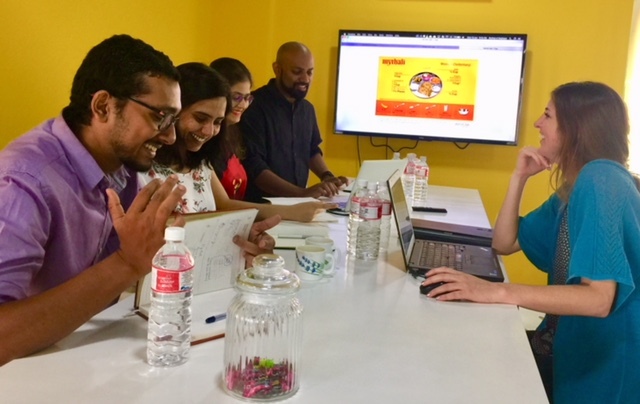 This idea of “small wins” helped our team in all aspects of our campaign—we found renewed energy in breaking down our goals into daily tasks, no matter how mundane they were: write two healthy articles, design a new poster, pass out 200 MyThali instruction cards, sign up 50 more people for our newsletter, recruit new employers for MyThali events, enter data from surveys, and the list goes on. Small wins can add up to big numbers, though—we educated over 7,250 people in just two months! This is a concept that can help all of us advance towards our goals in both our work and personal lives. I was given a rare opportunity to accelerate an idea into action—to see the direct impact of our mission in the face of others. While I’ve finished my fellowship, our work is really just beginning. I see the power that we have to make a difference when we come together to work towards a common goal. I look forward to my continued partnership with Arogya World as they seek to improve the health and well-being of people across the globe.